While in Jaco, we frequented a certain micro-roaster coffee shop. When we told Juan, the owner, that we were headed for Arenal, he said “Oh, you must visit Monteverde. It’s very special.” We did. At an elevation of about 4000 feet, Monteverde is high enough to have coffee plantations and cloud forest. We decided to hire a guide through the Curi-Crancha Reserve because they have very high powered telescopes and know what to look for. 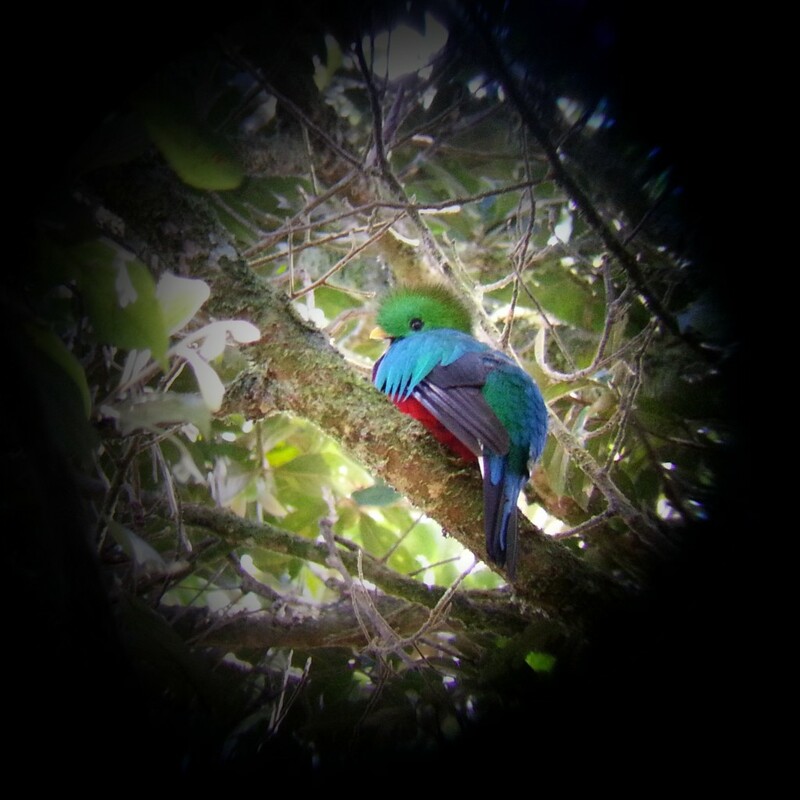 We were lucky enough to see a couple quetzels and managed to photograph one. The tucan we saw was not so cooperative when it came to posing for us. Previous PostContra Dancing Is NOT About Revolutions (but maybe it should be)Next PostAttack of the White-Nosed Coati Army!! Good to hear from you again. I came across a blog from a couple who are doing the same as you with your travels. check out their blog @ Gypsy nesters. Thanks for the tip. Took a quick look at gypsynesters and it seems interesting. Wow. He is beautiful. Never saw a Quetzel before. A very well trained guide in the Curi Cancha reserve helped us to spot the Quetzel in an avocado tree high in the canopy at about 20 metres. If you can believe it, Ivan placed his samsung galaxy against the viewfinder of the high powered telescope to get this shot. It took a lot of patience waiting for this juvenile male to lift its head and face us.